Thank You for Love to Live we are generously gifted to. As for Love to Live means an awakening attention and open heart to feel and see every moment of life as Miracle and Beauty. “Csikszentmihalyi describes our attention as “psychic energy” and articulates the fact that: a) those of us who can control it tend to enjoy life more; and, b) we have a limited amount of stimuli we can attend to in any given moment/minute/hour/day and, therefore, lifetime. For those curious souls, over a seventy year lifetime, assuming sixteen hours of waking time per day, this amounts to 185 billion bits of information over the course of our lives. That may sound like a lot, but it goes quickly, and the quality of your attention and where you choose to put it essentially dictates the quality of your life,” Brian Johnston said. So the more you control your consciousness the higher your quality of life. I try to enjoy every moments of my life. May is now and dandelions are blooming. I have found a beautiful poem I am in hurry to share. Flowing from our Father’s hand. Of our Father’s loving care. Thank You for this piece of Inspiration I am happy to touch it. 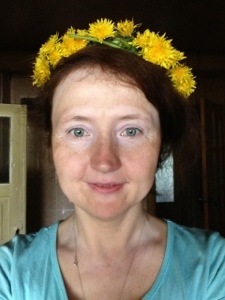 I would like to share a nice picture of myself I named “Goddess of Dandelions”. I am here Pure Beauty ;-). No make up and no special pose. But the moment was Perfect. I am happy absolutely here. My husband weaved the wreath and wore on my head. So I am Goddess of Dandelions. Thank You for my happiness here and now.